Barry Manilow (born June 17, 1943 in Brooklyn, New York City) is an American singer-songwriter and musician. He is best known for songs such as "Could It Be Magic", "Mandy", "Can't Smile Without You", and "Copacabana (At the Copa)". "—" means releases that did not chart. Donny & Marie in 1977. ABC special The Stars Salute Israel At 30 on May 8, 1978. May 8, 1982, Goldie & Kids a special where he acted in skits and sang "One Voice" and "I Am Your Child" with hostess Goldie Hawn. In 1985 Barry wrote and starred in the Television movie Copacabana (musical), which was inspired by his 1978 song Copacabana. On September 17, 1987, he was in the star-studded CBS special We The People 200: The Constitutional Gala taped at the Philadelphia Civic Center in Philadelphia, Pennsylvania to debut his song "Let Freedom Ring". On May 17, 1989, made first of eight appearances as a guest on The Arsenio Hall Show over five years. On May 17, 1993, Manilow made a guest appearance on the CBS show Murphy Brown. On the show, Candice Bergen's character often said she doesn't like Manilow's music. 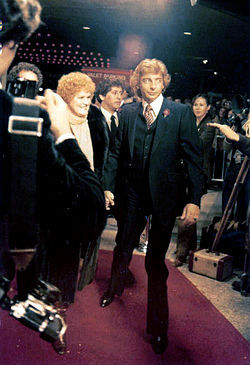 After she became a mother, Manilow appeared to sing her a sweet version of his tune "I Am Your Child", winning her over with the song about a parent's bond with a child. Later that year he was in England on Surprise! Surprise! with Cilla Black where he performed the new single he had recorded with Cilla of "You'll Never Walk Alone". Guest appearance in a 2001 episode of Ally McBeal. He played both a hallucination of Ally's and himself on stage at the end of the show. Played himself in a cameo in the 2002 dark comedy Unconditional Love starring Kathy Bates and Rupert Everett where "Can't Smile Without You" also played a key role in the plot. On December 11, 2003, Manilow was on the NBC show Will & Grace as himself backstage between tour stops. The name of the episode is "Fanilow" as in "a fan of Manilow". On April 20–21, 2004, Manilow got back together with Debra Byrd. She was his backup singer and was a vocal coach at American Idol. He was a guest judge for season three. The contestants sang his songs as the theme for the week. On December 8, 2004, he was a guest on the NBC special A Clay Aiken Christmas, hosted by the former Idol runner-up. On March 21–22, 2006, Manilow returned to American Idol in season five. 1950s music was the theme. He again helped the top eleven finalists to fine tune their performances and again sang on the results show. In November 2006, he was on Logo's reality show Jacob and Joshua: Nemesis Rising as himself in Las Vegas for a recording session with the twins. On November 23, 2006, Manilow was live on a float in the Macy's Thanksgiving Day Parade. He sang the song "What the World Needs Now" on the television broadcast of the parade. 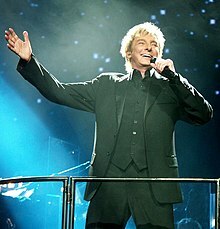 On December 2, 2006, Manilow was the celebrity guest and theme for the week on The X Factor. On December 12, 2006, he was live at the 2006 Royal Variety Performance and performed a selection from his latest album. The Tonight Show with Jay Leno on October 31, 2007, on November 17, 2008, and on July 12, 2011. On December 4, 2008, he was the main guest on UK's The Graham Norton Show. Barry narrated and wrote original music for the Ocean Spray Christmas special "Cranberry Christmas". He was a guest on Friday Night with Jonathan Ross (UK) on September 11, 2009. On October 2, 2009, he was on BBC Radio 4's Desert Island Discs. He was a guest on The Jay Leno Show (US) on December 10, 2009. He was a guest on The Tonight Show with Conan O'Brien (US) on January 21, 2010. He mentioned that, before he became famous, he wrote advertising jingles, including two well-known jingles for Band-Aid and State Farm. Also, he commented on his diet of "forgetting to eat". On February 6, 2010, he was a guest on Jimmy Kimmel Live! where Jimmy showed a photo of him in the 1970s and discussed his new album. On December 11, 2010, he ended the Nobel Peace Prize concert in Oslo, Norway singing four of his most known and popular songs. The Nobel Peace Prize was awarded to the Chinese dissident Liu Xiaobo. On June 15, 2011, he was on "Good Morning America" performing his new album, "Fifteen Minutes". On June 23, 2011, he was on CNN's Piers Morgan Tonight. On June 24, 2011, he was on the UK's Paul O'Grady Live. On October 28, 2011, he was the star of the UK's show An Audience With... Barry Manilow. On December 14, 2011, he was on the royal variety show on ITV. Manilow officially came out as gay in April 2017, telling People that he had kept his sexual orientation quiet out of concern that it would disappoint his largely female fan base, but when his fans learned of the marriage, they were supportive. ↑ Nelson, Jeff (5 April 2017). "Barry Manilow Reveals Why He Didn't Come Out for Decades: I Thought I Would 'Disappoint' Fans If They Knew I Was Gay". People. Retrieved 5 April 2017. ↑ "Barry Manilow says he's gay, and he kept sexuality secret for fans". Los Angeles Daily News. 5 April 2017. Retrieved 5 April 2017. This page was last changed on 29 November 2018, at 04:15.